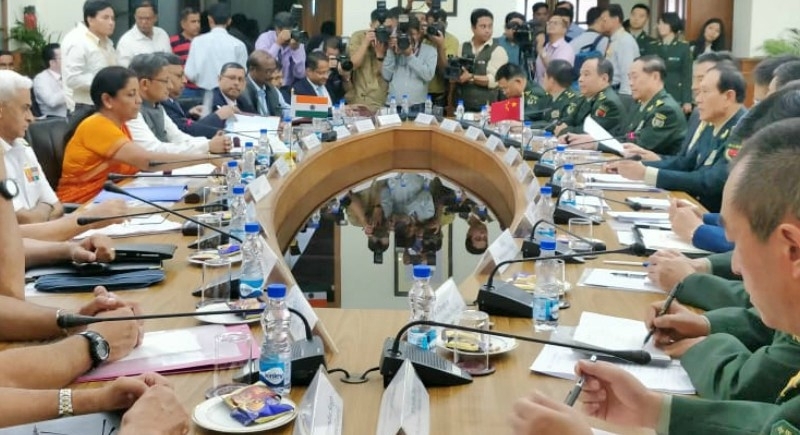 New Delhi, August 23: Consolidating ties and enhancing relations between both the countries, Defence Minister Nirmala Sitharaman and Chinese Defence Minister Wei Fenghe discussed ways to remove distrust and boost coordination between the armies. The primary objective of Chinese Defence Minister Wei's visit is to deliberate with Indian defense establishment on the implementation of decisions taken by PM Narendra Modi and Chinese President Xi Jinping during the informal summit in Wuhan in April. In the delegation level talks, the Indian side is likely to raise the issue of the presence of a sizeable number of Chinese troops in North Doklam. The two sides discussed ways to deliberate on a mechanism under which troops from both sides will inform each other before carrying out any patrolling on the disputed areas along the nearly 4,000-km border. Defence Minister Wei arrived in New Delhi on Tuesday on a four-day visit to India. His visit comes nearly three-and-half months after Prime Minister Narendra Modi and Chinese President Xi Jinping agreed that strategic communication between the two armies should be enhanced to avoid Doklam-like standoffs. Chinese defense minister met Prime Minister on Tuesday during which PM Modi said both the countries are handling their differences with sensitivity and maturity by not allowing them to become disputes.